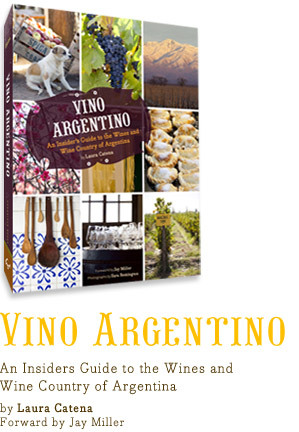 Vino Argentino is an insider’s travelogue to the Argentine wine country. It is part viticultural primer, part cultural exploration, part introduction to the Argentine lifestyle. It is about the ascent of the mighty Malbec grape into the stratosphere of world-class wines. It is about single-lane roads lined with vineyards and patches of brush set against a breathtaking backdrop of snow-capped Andes peaks. It is about schoolchildren in white uniforms holding hands on dirt sidewalks, and gardens overflowing with flowers and fruit. In this book, I will take you exploring through the countryside of my childhood, so that you come to know its towns, vineyards, restaurants, and inns as intimately as I do. Vino Argentino will lead you through the various wine regions of Mendoza, each with its own distinctive climate, soil, wine varietal, and social and viticultural history. You will understand why a Malbec from San Carlos is so different—blacker, more floral and more mineral—from the jammy and smooth old-vine Malbecs of Luján de Cuyo. You will long for the easygoing charms of Salta—even having your car blocked by cows standing in the road becomes an excuse to spend hours drinking mate with your fellow travelers. You will fantasize about the uninhabited plains of Patagonia, where aristocrats and Italian countesses have fallen in love with old vines and Pinot Noir. And you will never again think of Argentine Malbec as the latest fashionable wine import; rather, you will long for the mountain-flanked vineyards of Mendoza, for the alfresco pleasures of a weekend asado, for the late-night dinners in Buenos Aires, for the old Mendozan wineries filled with nineteenth-century charm, and for the modern architectural creations of French wine industry scions. The recipes at the end capture the textures and flavors of Argentine cookery, which is part Italian, part Spanish, and part Indian, but mostly about the national obsession with barbecued meats. This book is my personal invitation for you to visit and experience my country, Argentina.